We're getting there, folks. The weekend is making its way here. I don't know about you, but to me it slowed down a bit yesterday afternoon. Here's to hoping it picks back up again. In the meantime, let's do our best to get your gaming tables looking as good as possible, shall we? 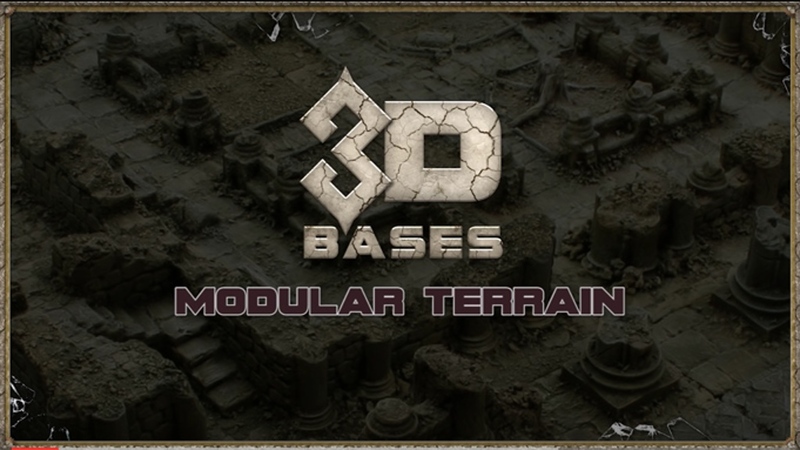 Today's Terrain Corner features: Manorhouse Workshop Launches 3D Bases - Modular Terrain Kickstarter, Printable Scenery Running Apocalypse Ruins Kickstarter Campaign, Ice Desert: Pwork Wargames Sci-Fi Gaming Mat Now Available, and Forge Prints Launches Foundations 3 Kickstarter. Thanks to all of you for your support. Without you we wouldn’t have been able to fund this so quickly (less than 24 hours). But this is only the beginning. We will continue to give value to this project with a lot of Stretch Goals. The first 2 are free: the wooden bridge and the throne. Both are very useful in a lot of situations. 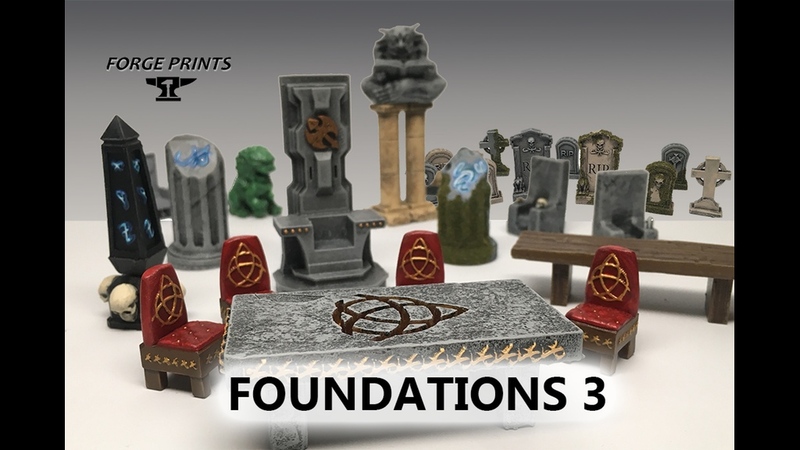 The APOCALYPSE RUINS is a complete modular scenery system designed to be printed on any home 3d printer. The Apocalypse Ruins are based on the 50 x 50mm and 100 x 100mm building system (2 inch by 2 inch) and they are specifically designed to work with all 28mm Wargames and RPG's. They can also be resized before printing to suite any scale. 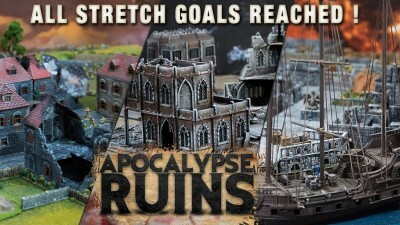 The Apocalypse Ruins come in 3 styles (3 base pledges), The stone ruins; Historic WWII Ruins and Gothic Sci -Fi Ruins. We have set up solo and combo pledges so you can grab the style that best suits your favorite game systems; or combine them all to get absolutely everything in the Kickstarter! Those that pledge to ANY of the combo pledges will gain the bonus items absolutely free. 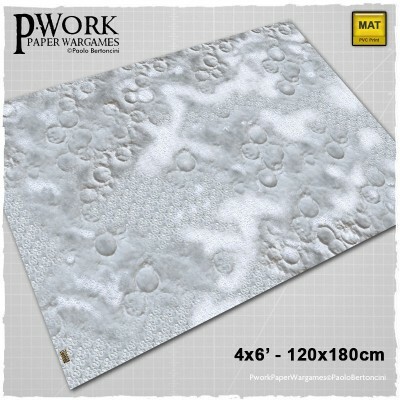 The Wargame Mat Ice Desert offers the possibility of setting battles between armies of miniatures among craters of ice, snow-covered canyons and blasts of frosty wind. The mat is a perfect Science-Fiction setting for futuristic game play on a frosty planet, and also for fantasy fights! Are you ready to battle? We are back with our next evolution of our Foundations series. This is our first introduction of resin pieces and we hope that everyone likes it! Similar to our other Kickstarters we have already made the majority of the investment to bring this to life. We are doing all casting in house after heavily investing in Conley Casting equipment and all of the products shown are hand painted and cast from our production and master molds.